“THEY are famous for doing nothing,” says singer Jamelia in the Sun. The woman with a name like an antiseptic ointment tells the Sun that Wags are “famous for doing nothing…They’re taking advantage of their partner’s position.” The Sun says that Jamelia is calling the Wags “leeches”. All fair enough. But what has sparked Jamelia’s sudden bout of Wag-bashing? 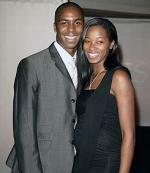 Why it’s the fact that she is dating Darren Byfield, who plays for Millwall. In defending her position, Jamelia sounds not unlike other singers with footballer lovers, namely Victoria Beckham and the charmless Cheryl Tweedy-Cole. Of course, Jamelia is her own woman. For one thing, Darren plays for Millwall, a team blessed with all the glamour and pizzazz of last night’s kebab. For another, Darren is unlikely to ever play for England and so afford Jemelia the chance to follow the team like a pissed-up lager lout clad in Gucci and orange spray paint.